in the bible is thought to be a reference to raw, goat milk and raw honey. 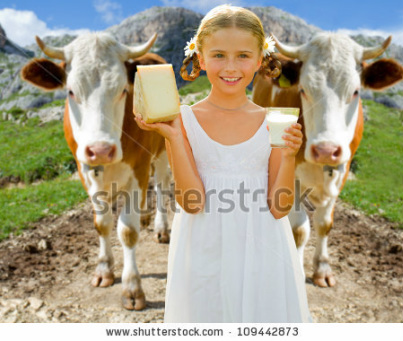 TDairy products are one of the most common foods consumed around the world. Some cultures survive on diets consisting of up to 80% raw cow, goat, &/or sheep milk. In the western world, however, dairy has become one of the most inflammatory foods. A recent discovery shows that a genetic shift in the casein molecule has produced a powerful toxin linked to numerous disorders and diseases. The bond between histidine and its linked amino acids is much weaker and much more easily broken than the bonding of proline in A2. This splitting happens during the digestive process and creates a peptide called beta casomorphin 7 (BCM7). BCM7 is an opioid, which gives it morphine-like qualities. This creates rampant oxidative stress in the gut and blood stream. When BCM7 passes into the bloodstream, it is able to cross through the blood brain barrier. In the brain, it can bind to opioid receptors and cause symptoms of schizophrenia, autism, and other mood and neurodevelopmental issues. Research performed on rats has shown autistic and schizophrenic type behavioral changes after the rats were injected with BCM7. A1 beta casein and its byproduct BCM7 have also been linked to cases of type I diabetes, digestive disorders, neurodegenerative disorders and heart disease. These issues have the most supportive evidence linking them to A1 beta casein. This does not mean that A1 beta casein isn`t associated with other health disorders as well. It can be quite challenging to enjoy dairy products and avoid A1 Beta Casein in the western hemisphere. You certainly have to look for specific breeds of cow that will not be labeled at the grocery store. A1 beta casein is produced by cattle belonging to the Bos Taurus subspecies, which is the primary breed of cattle in the western hemisphere. The Guernsey breeds produce only about 10% of their beta casein as A1 while the Jersey breed produces about 35%. The Ayrshire, Holstein, and Frisian breeds tend to produce 50% or more. Goats do not produce A1 beta casein making their milk and dairy products. The `land of milk and honey` that was described in the bible is thought to be a reference to raw, goat milk and raw honey. Raw milk from grass-fed animals without A1 beta casein has a number of amazing health benefits due to the healthy omega 6:3 ratios, conjugated linoleic acid, and other immune supportive properties. Organic butter from a grass-fed cow is still very healthy regardless of the breed of cow because it contains little to no protein. Research has found that cheese, yogurt, and fermented milk products from A1 beta casein containing breeds produce around the same amount of BCM7 as regular milk. These products should only be consumed from breeds of cow that produce very little A1 beta casein or none at all.